The VSCNA exists to encourage the maintenance, restoration and preservation of vintage SAABs. Your Vintage Saab Club Of North America, or VSCNA for short, has been going strong for 39 years now. It's all due to your hard work for the "2-digit Swede" marque we all love! As you flip through the pages of our quarterly newsletter “Vintage Views,” you will enjoy a wonderful mix of vintage content in an easy to read format. No corporate news, no articles on the best oil filter or uneven tire wear, just a whole boatload of Vintage ONLY articles and classifieds. In addition to our quarterly newsletter, the club provides a mountain of parts interchange data, vintage sales and marketing literature, parts sources, tech tips and meetings. The VSCNA is not just another one-man show. We have assembled the foremost group of vintage Saab aficionados to help make your vintage Saab owning experience a pleasurable one. 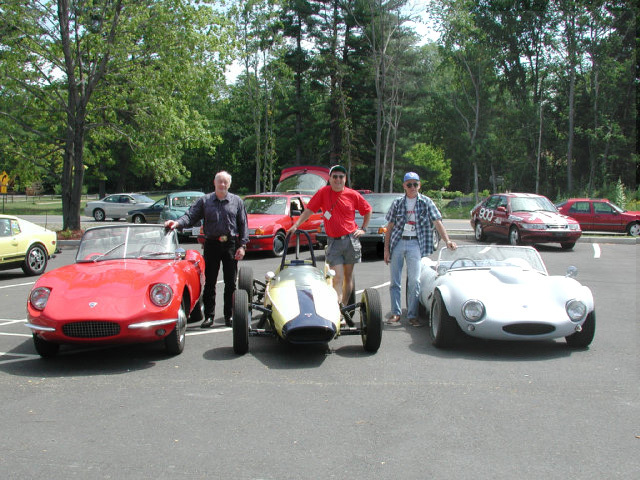 From l-to-r, Quantum III, Bud Clark, Quantum Formula S, George Vapaa, Dave Hosmer, Quantum V. At the '00 SOC.